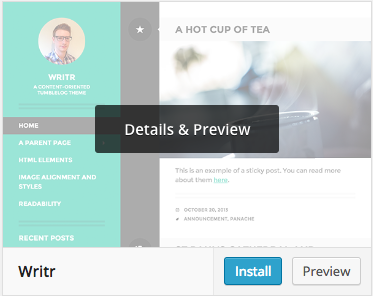 There are two ways to go about when installing a WordPress theme. Either you can use the administration panel or you can install the theme through an FTP-program. Log in to your control panel and scroll down to Web Applications and then click on your WordPress. When you have done that you will see the WordPress icon and to the right of it you will see three links. Click on the one that ends with /blogg/wp-admin/ and you will enter the admin panel. When you are in the admin panel you will get a column to the left, there you will find appearance. Hover your mouse over appearance and press themes. 3. At the top of this page, you will see a box where it says ”Add New” if you press it you will be able to browse among the themes that the WordPress developers have created. You can also browse among popular themes or if you want you can filter your results so you can browse themes that fit what you’re after. If you want to upload your own themes then press ”Upload Theme” then you choose what file you want to upload and click on install now. 4.If you have found a theme that suits you click the blue install button and when the installation is done you press activate and the theme will be installed. When you have found a theme that suits you, you download it to your computer and extract the files from the zip-file. Now start your FTP-program. If you do not have an FTP-program you can download FileZilla it is free and works perfectly fine. Connect to your server. When you have started the program navigate to wp-content/themes and upload the files you extracted previously. 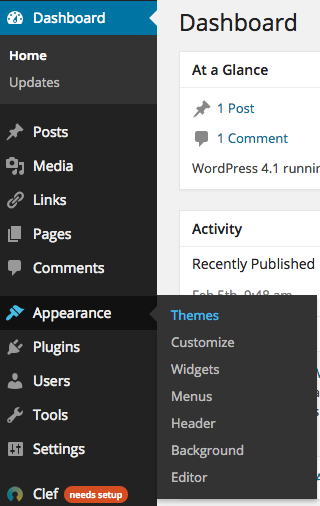 Now you log in to your admin panel and your theme should be at the bottom of the page ”Appearance”-”Themes”. Click on ”Activate” and it should be done.